Code Black Coffee is a cafe and specialty coffee roaster in Brunswick who have opened up a second outpost in Howard Street North Melbourne. Like the original location the Code Black Howard Street roasts its own coffee but the roasting machine is really more for decorative purposes as most of the coffee is still roasted in Brunswick. The new cafe is a gorgeous light-filled warehouse conversion by ZWEI Interiors Architecture, The bricks have been painted white punctuated by lacquered green steel beams and blonde wood abounds. I particularly love the slatted staircase. 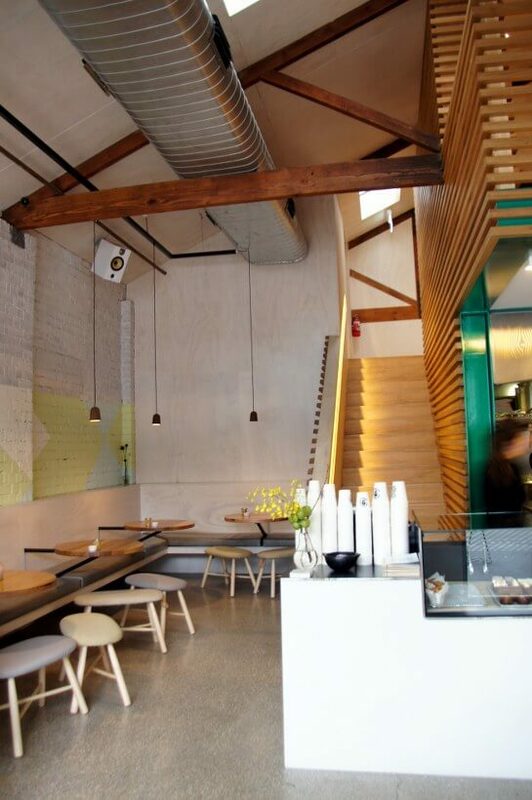 Seating encircles the barista station and open kitchen and a mezzanine level upstairs, though I’d avoid the awkward mini tables at the banquette unless you’re up for holding yoga side twists during your meal. The food menu has a similar quirkiness as the Brunswick menu and takes inspiration from the fact that the space used to be an old car garage. I’ve explored some of the options over several visits. Black beans with jalapeno cornbread ($12) was a punchy dish of spiced beans, a fried egg and a spongy, cake-like slice of cornbread. I opted for a side of pork belly ($4), a thick cut of belly cooked a little too dry for my liking. Overall I would have liked to up the ante on the chilli – just felt like a dash of hot sauce would have really enhanced the flavours. For something lighter the seared tuna salad is ah-mazing ($17). Super-fresh slices of herb-crusted rare tuna with a wholesome mount of cucumber, snow pea tendrils and bok choy plus grains of millet and chia for crunch. If you have a sweet tooth I recommend the apple salted caramel hotcakes ($14). Ricotta makes the hotcakes very light and inside you’ll find shreds of apple. It’s served with salted caramel sauce, crunchy candied pecans and slices of freeze dried apple. Code Black Howard Street is a extension, not a duplication of Code Black Coffee in Brunswick. I actually prefer its lighter, brighter interior to the original location, while the food and coffee as just as spot on.